Reflecting on the days I spent as a delegate during the AFT national convention in Pittsburgh (held July 13-16), I was reminded of the fall of the Berlin Wall and the collapse of Soviet Communism in 1989-90. No one predicted it, and it seemed to come out of nowhere. But peace activists in the West who organized international support for struggles of dissidents in the Soviet Union and Eastern Europe saw the social ferment. Here I refer especially to the Campaign for Peace and Democracy, East and West, a project of Joanne Landy (member of the New Politics editorial board), along with Tom Harrison (also on the New Politics board) and Gail Daneker. The Campaign’s work of developing networks among activists internationally for peace and social justice understood the deep contradictions within the Soviet Union and within the Communist bloc. While activists were as amazed as others at how and how fast Communism imploded and democratic forces at last set free, the Campaign’s political premises and organizing were aimed at this happening. What the fall of the Berlin Wall should remind us is the desire for freedom and dignity cannot be suppressed indefinitely, even by authoritarian regimes that govern in one-party states. The dominant Cold War thinking that only military threats could dislodge an authoritarian regime so we had to choose between Communist repression and the West’s military interventions and suppression of human rights was so pervasive, its proponents in the media, government, and the academy were blind to events that contradicted the assumption that Communism could only be defeated by containment. Their focus on the Russian elite and its East European puppets as the only force that could produce change obscured from view social forces not controlled by the Kremlin and Politburo. Hence they didn’t see what ultimately caused Communism’s implosion: An elite that assumed it decided the truth and had the right to set policy could not reconcile forces for freedom, democracy, and better living standards with pressures on the system for economic reform. This history has come to mind as I've read accounts of the convention by reporters without knowledge or analysis of the grassroots movements of parents, teachers, and students who have been challenging the bipartisan educational reforms imposed on the schools, or of the teachers’ revolts against business unionism. They filed stories that took the AFT leadership’s propaganda for reality. 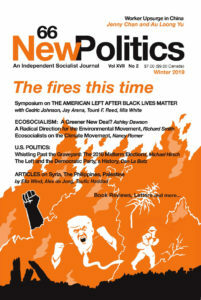 In contrast, writers for New Politics have described how the Shanker/Feldman/Weingarten Progressive Caucus machine has been a brake on struggle and has stripped the national union and convention of democratic space, leveraging its stranglehold in the UFT (United Federation of Teachers, the New York City AFT local). This archive documents too much history to repeat in my report but it provides the backdrop for my analysis and I encourage readers unfamiliar with this material to read it. Reporters didn't understand the AFT’s complicity in "corporate school reform," (we can also describe this as neoliberalism's global project to privatize the schools and destroy public education), its tacit and explicit support of policies ranging from the testing regime to school closures in low-income neighborhoods of color; from the increased push-out of students of color in the school-to-prison pipeline to countenancing good teachers losing their positions and put in “teacher jail,” “displaced” teacher pools, and “rubber rooms.” To the media it seemed the AFT had successfully met the challenge of Janus, the narrative the union has pushed among its supporters. And one can see how someone who was reporting "on the ground" or relying on union press releases, without knowledge of what's happening in schools, would be persuaded by rousing stories from locals that had persuaded the vast majority of members to sign cards stating a commitment to “stick to the union.” This has been the AFT's most assertive method of addressing what will occur in being denied the legal right to collect fees equivalent to services it provides for everyone in the bargaining unit, the result of the SCOTUS Janus decision. Surely that was evidence of the union’s strength, a sound basis for its purported confidence post-Janus? The reporters didn’t ask the hard questions delegates had no opportunity and perhaps no heart to pose: What had been heard from members during these campaigns? What had the union learned, and how would locals alter how they operated as a result of this campaign? I had a glimpse of what occurred in the NYC campaign, as I was traveling to the convention on the train. I sat behind and eavesdropped on a conversation of New York City delegates from the UFT, all members of the Progressive Caucus AFT President Weingarten controls. One staffer loudly bragged about how easily he had persuaded people to sign the cards. “So I told him that only members get legal representation, and bam! He signed right then!” I noticed his colleagues didn’t express enthusiasm and didn’t praise his success. Perhaps they don’t like him – or realized why this is a disastrous strategy, for reasons I hear constantly from teachers who are leery of the union. One frequent complaint of young teachers in the “red state” walkouts was they saw union representatives only when a teacher needed legal services for a serious offense, often one they thought inimical to our professional ideals. However, they felt the union offered them and other teachers trying to do help students under oppressive conditions no aid. Instead the union focused on protecting teachers they viewed as bad apples, a common complaint one hears from parents, exploited by the Right. To be clear here, teachers need due process when accused of unprofessional conduct and the union must defend them by providing legal representation when needed. However, the larger reality is the union is "irrelevant" (the word I hear most) in protecting teachers who are doing their jobs well and are victimized by administrators, who have unchecked power to decide if a teacher receives a career-ending evaluation. Experienced African American teachers are disproportionately represented in “teacher jail” or in the pools of teachers displaced from schools when they close, because they stand their ground when administrators do not treat them respectfully. Using legal representation as the main argument to sign teachers up to the union miseducates that the best or only way to push back on the culture of harassment in schools is with a lawyer the union provides. In reality, the best protection of teachers’ voice, power, and good teaching is a culture of collaboration and solidarity, supported by a vigorous union chapter that pursues grievances through formal channels and informal actions. In its rhetorical embrace of “social justice unionism,” the AFT claims it is “empowering members,” but as the sales pitch I overheard from the UFT staffer reveals, the rhetoric in many places is gas lighting, masking continuation of “business unionism.” The alternative, which the AFT national organization doesn’t understand or know how to do, is organizing members to fight on their own behalf, helping them to identify their needs, and supporting them in collective struggle with staff help and resources. What did most delegates think and believe? No one, including me, can say with any accuracy. The machine controls the committees (Progressive Caucus members chair the committees; Albert Shanker’s daughter was secretary for one of them), and committee “recommendations” all passed on the convention floor on voice votes. There were no votes except the election of officers that respected the number of members each delegate represented. Voice votes are highly skewed because the UFT sends all of its 600+ delegates, elected in a block, with no proportional representation. So while we have no empirical data about what delegates thought, I contend that their complete passivity, evidenced by the lack of questions or debate on even the most important organizational questions to come before the body, and the paucity of resolutions submitted by locals to be considered, signaled apprehension and confusion about the challenges we face as a union. Passivity is often assumed, incorrectly, by those in control to signal assent. The President of the Philadelphia local expressed this when he looked out at a “crowd” of 60 people, 20 of them staff, at a city-wide membership meeting and observed the small attendance proved members supported what they were doing. The savvy, committed activists in Philly’s reform movement, organized as the Caucus of Working Educators, have seen from work in the schools that the leadership clique has fallen into the trap of believing its own propaganda. Good teachers (and organizers) know that people who are deeply engaged with ideas, in support or opposition, and feel their voices will be heard, have questions. As is the case throughout the nation's cities, many Philly teachers are deeply angry or dissatisfied with the union, but most are alienated. That’s why participation in union elections and contract votes rarely exceeds 30%. One stunning example of the delegates’ passivity occurred when the constitutional amendment that increased national "per capita" dues for purposes of organizing came up for a vote on the floor. No one spoke against it, but even more alarmingly, not a single delegate asked for specifics how the money would be used and why. The only question was from Jesse Sharkey, of the Chicago Teachers Union, (the union that is the O.G. of the reform movement) who went to the mic to inquire politely about an embarrassing error in the printed resolution. Was the increase in dues actually for the years printed in the constitutional amendment? Weingarten’s voice was bristling like a teacher calling on a smart student who makes accurate corrections to the teacher's lecture as she called on Sharkey. She then realized the materials were erroneous, and yes, Jesse was correct. Thanks. Still, no one questioned why a union incapable of presenting to the body an amendment that accurately stated the facts of its dues increase should be trusted to use the funds wisely. The key method of smothering debate was to have endless presentations and speeches, packing the agenda with Democratic Party politicians, though allowing Bernie Sanders to have a slot. You can watch the videos of the speeches on the AFT website, but there will be no mention of ideas that ran counter to the party line. The verbatim transcripts that delegates once received each day were eliminated long ago by the machine. Delegates heard from an unending stream of Democrats (mostly White men) who ostensibly know and care about education because their parents or grandmothers were teachers. They reinforced the message of the union that our (only) strategy to protect public education, democracy, and our members is to elect Democrats. Tom Wolf, Governor of Pennsylvania, was the first politician to speak. He was explicit that he supported the “free market” and a “limited budget” in which education could be a “priority.” Thus the AFT opened its convention supporting a presumption that we must accept austerity, the idea that working people should sacrifice so that corporations and banks can have maximum profits, the very thinking that infuriated voters in the last election and sparked the "populist" revolts of both Trump and Sanders. No mention was made by the Democrats or the union – or reporters – about the fact that one-quarter of AFT members voted for Trump. The stories in endless presenations and speeches misrepresented too much for me too catalogue. The sincere reports from individuals about what teachers or the AFT had done to support social justice punctuated a stream of self-congratulatory videos and speeches that misrepresented the history and politics of the union’s actions. One especially egregious recasting of reality was the depiction of the AFT as being a militant force in Puerto Rico though it had, in fact, decertified the home-grown local (the FMPR) when it was made illegal for striking. Another astounding misrepesentation was Weingarten’s implication that she and the AFT had helped organize the Red state walkouts, which even the New York Times eventually “got” had been conducted independently of the local and national unions. It’s tempting to focus on Weingarten as an individual rather than on the underlying problem of structures and policies that subvert democracy, which is a mistake. The crisis in the union is of democracy and cannot be pinned on Weingarten alone. Having said that, it was clear from her role at the convention that one cannot separate her person and functioning from the union’s one-party rule. The convention was orchestrated to emphasize her personal importance and confirmed what I have learned in “off the record” discussions with present and past staff who are worried about the future: Weingarten micromanages staff and controls the narrative and the union’s decisions. Shrill speeches with fiery claims about the union’s strength and determination, intended and probably perceived by some as showing militancy, substituted for substance about implementation of a program to defend public education. The all-too brief floor discussion led by union leaders who have been elected by reform movements sharply contrasted with the bromides and cheerleading that characterized the rest of the convention. Their speeches explained why we need to do what the AFT leadership cannot or will not: mobilize members for direct action, developing mutually respectful alliances with communities that have been so hurt by economic policies supported by both parties, using the strike, labor’s ultimate weapon, when we must to protect the dignity of our work, schools, and kids. This short interlude was, unfortunately, an isolated breath of fresh air that could not aerate the hermetically-sealed convention center and its proceedings. How is it possible that at a national convention in 2018 we had no engagement with ideas about combatting conditions that have demoralized and angered our members? To ask the question is to answer it if one knows the AFT’s complicity in the reforms that have made teaching drudgery, compensated by stagnant or falling wages: standardized testing that ties student scores to teacher evaluations (supported by the AFT); budget cuts by the states and federal government (met by ineffective lobbying) that leave teachers with huge classes, buying supplies for students they often must teach in closets and hallways in dilapidated buildings; school “choice” policies (supported by the Democrats whom the AFT has endorsed and helped elect) that have intensified racial and class segregation; and the emotional drain of working with students who are physically and emotionally damaged because the social safety net has been shredded and economic deprivation deepened (in the bipartisan project of austerity). The convention exposed a national leadership unable to develop alliances with the real, existing social movements fighting against the GOP and Trump. Chief among these natural allies are parents and activists who are battling racism in the Black Lives Movement; immigrants facing xenophobia, directed primarily against Latinx immigrants and Muslims; and the #MeToo regeneration of feminism. However, the AFT has borrowed a tactic from the NEA (National Education Association), the other, larger U.S. teachers union, to try to mask this problem: It allows resolutions that create a paper record of support for causes the Left embraces. At this convention that strategy included a mention of U.S. imperialism in a resolution about stopping “endless wars.” While this resolution was allowed to pass through committee, coming to the floor for approval, the leadership undercut the motion’s political aim of educating members about the U.S. war machine by orchestrating a special order of business saluting AFT members who are veterans. Asking all veterans to rise to be applauded, and then speaking for this special order of business (passed with no debate asked for or permitted – so much for the scrupulous upholding of parliamentary rules of order!) Weingarten encouraged a patriotic frenzy, shouting support for brave soldiers who defend democracy when they are sent to serve abroad, failing to mention that the wars are imperialist ventures – as the resolution explained. Another resolution that the leadership endorsed and was passed called for presenting a balanced curriculum about the military in higher ed, noting ROTC is free of this regulation of other course work in the university. Though the motion mentions the federal law that gives military recruiters access to students’ contact information, it did not call on the AFT to oppose this provision in its negotiations about federal laws funding elementary and secondary education. Parents may withdraw permission for the military's access to contact information of their children, but few parents know of this right. Military recruiters park buses with video games simulating war outside of schools serving low-income students, especially those with high concentrations of kids of color. The union is mum about this practice though activists opposed to military recuriting in high schools have challenged the practice. Further, should we pass motions about developing curriculum that give the AFT national office final control of content? After all, this is a leadership that ran a smarmy attack on historian Howard Zinn in its magazine, the American Educator, and refused to allow the Zinn Education Project, which continues his work of bringing a "people's history" to the schools, to respond in any form, until a public campaign exposed the union’s censorship and the union relented, allowing publication of a letter to the editor critical of the article. As these resolutions show, the union often covers itself on the Left with “feel-good” motions that it will not implement, separating them from its core legislative and political work. Another example of this tactic was its refusal to include wording about "recruiting and retaining teachers of color" in its position on improving the quality of teaching. AFT’s policies about "teacher quality," our answer to the neoliberal “accountability” policies that underlie use of standardized testing, endorse the tests’ use. So AFT’s call for “rigorous teacher preparation and licensure” is operationalized in its endorsing use of standardized tests for entry and exit from teacher education programs. The tests are well-known as being culturally biased, measuring social class more than the knowledge, skills or aptitudes needed to teach, and they have reduced the pipeline of young teachers of color to a trickle. The tests, and the AFT in supporting their use, have undercut programs of urban teacher preparation in public higher education that have historically been the vehicle for working class students (mainly women) of color to become teachers. An important exception in this convention’s absence of frank discussion about organizing, in particular the difficulty of forming alliances with communities of color and other unions, the challenge of including anti-racism work in union organizing, was the session organized by the Alliance to Reform Our Schools (AROS). AFT contributes to AROS and it permitted the meeting to be included in convention materials but no time was afforded during convention hours. (Weingarten popped in to make remarks at the end.) Still, this was a valuable, inspiring intervention by the panel organizers, another brief respite from the relentless cheerleading. The convention was marked by a paucity of resolutions submitted by locals and the lack of coordination on resolutions that took up the same concerns. My hunch here (about which I invite replies from those more knowledgeable) is that attention of progressive activists is almost entirely focused on local organizing, in preparation for Janus and contract campaigns. Most locals are overwhelmed and disoriented, having no energy to devote to debate about foreign policy, domestic politics, or even the union’s educational program. During the convention I tweeted and posted on Facebook offering a counter-narrative to the official proceedings. My tweet garnering the angriest response (in a barrage that seemed to have been prompted by the union) described the convention as having an "aura of fear" masked by cheerleading. I should clarify that no one expressed fear, but as someone who spends a great deal of time talking with working teachers, I think many delegates know there is a deep malaise among members, which is a frightening reality given the surge of Right wing activity, White supremacy, and anti-immigrant sentiment. Many teachers feel the union is part of the problem and are unconvinced that it can be a solution. The passivity in the convention was due, I think, to this unspoken and chilling truth. Addressing it required asking questions that challenged the depiction of reality (We're doing great!) encouraged and enforced by one-party control. The incessant references to Weingarten’s splendid leadership, her need to personally dominate the conference proceedings, combined with what seemed scrupulous respect for procedural aspects of debate amid the machine’s control of outcomes, combined to create an atmosphere that suppressed debate and thought. The fear was of thinking critically because thinking might lead to questioning authority, and that is clearly taboo in the national AFT. Dissidents in the AFT are not murdered or jailed. Those who don’t toe the party line, however, anticipate, correctly, there will be reprisals, as there are in New York City where the machine conspires with administration to fire troublemakers. On the national level, Weingarten’s machine exercises its undemocratic control by demanding that presidents of major locals and state federations who want to sit on the national AFT Executive Council join her Progressive Caucus. Though the Executive Council is elected in a process conducted in accordance with federal regulations, its functioning is thoroughly undemocratic. It functions in secrecy. No minutes are published for the membership to see. Its members’ votes are not made public. Hence there is no way for members to know for sure how their representatives have voted. It is an open secret that organizing funds from the national organization may be withheld if locals don’t “play nice” enough, though the Chicago Teachers Union has been especially adept at leveraging its power and acting independently. Fear of reprisal and hope to garner money or political support for their local are what keep dissidents in line. The harm in their participation in the AFT Executive Council was apparent in the amendment to change the AFT constitution to alter what had been a “permanent” affiliation to the AFL-CIO to arrangements approved by the Executive Council. The amendment, which passed without opposition on the floor except in my remarks, gives the AFT Executive Council the power to negotiate terms of affiliation with the AFL-CIO with a 2/3 majority. I noted the amendment should actually have been called the “threat to disaffiliate with the AFL-CIO," an interpretation denied by speakers from the Executive Council until one boasted in a get-tough speech we were indeed threatening to disaffiliate, a necessity to make other unions “pay attention” to us. Whatever the reasons for supporting a threat to disaffiliate from the AFL-CIO nationally and state and labor local councils, they were to me insufficient to give authority to a hand-picked Council that operates secretly to make a seismic change in our union and the labor movement. Power to decide affiliation should be the membership’s, and in supporting this amendment without having consulted their members, the Executive Council reinforced the undemocratic culture and practices that inhibit reviving the union at its base. This same situation occurred when the Executive Council conducted voted to support Weingarten's wish for the early endorsement of Hillary Clinton in the Democratic primary. Any endorsement should have been made by the membership, informed by robust debate in local and national publications and venues. As for the substance of the amendment, threatening disaffiliation, I can see its apparent advantages because AFT locals and state federations face betrayals by other unions. AFT locals also undercut one another. For instance, the United University Professions, (UUP) the AFT local representing State University of New York (SUNY) faculty and professional staff, refused to support the campaign for adjuncts to win “7K” base salary for teaching a 3-credit class, spearheaded by the City University of New York union, the Professional Staff Conference (PSC). TNew York's state AFT affiliate refused to support the PSC in pressuring the UUP to respect the "7K" minimum. Perhaps disaffiliation from the AFL-CIO – or the AFT – will support the rank-and-file movement and in so doing help revive and rebuild the labor movement by creating a new labor alliance? This was the argument I heard from a CTU activist I respect. If this is the reasoning we must have that discussion, not hide behind an Executive Council resolution that pretends not to threaten disaffiliation while doing so, for reasons not known to or debated by members. While it may seem expedient for real progressives to join the Progressive Caucus machine, they undercut the creation of a national caucus that challenges one-party rule by doing so. They weaken union democracy and in the process contribute to the national union’s internal decay. Why not instead bring this question of joining the Progressive Caucus as the quid-pro-quo to sit on the Executive Council to the most representative bodies of the local, to be decided there? Ask the House of Delegates, the Representative Assemblies, or for Presidents of state affiliates, the state convention what their Presidents, representing them, should do. This models democracy in the locals and state federations and simultaneously frees the Presidents to serve – or not – depending on their members’ wishes. If their members direct them to join the Progressive Caucus in order to be on the AFT Executive Council, presidents come armed with the knowledge that their members are looking out for them. Of course, this strategy assumes that the progressives themselves believe in and want democracy in the locals they represent. Over and over I was asked by reporters and by activists what lies ahead, post-Janus in a Trump presidency? With the caveat that no one has a crystal ball, I think the future of the union is in the hands of a new generation of activists, represented in the convention by a small but not insignificant number of delegates, but mostly not seen or heard because the members are new to union activity or active in caucuses that have not (yet) won power. Many are socialists, young people radicalized by Trump’s election and the Sanders campaign. Often they are in Democratic Socialists of America. This influx of socialist teachers and ideas has sparked creation of a Socialist Educators Alliance. All school workers who self-identify as socialists, in NEA and AFT, or in states with no unions to represent them, are welcomed. A closed Facebook page has been created to commence the project of creating space to study about and inform work as educators with the understanding that we must name capitalism as a problem and the vision of a democratic, just, equal society we call “socialism” as a solution. Further hopeful news, not spoken at the convention, is that the walkouts that marked the “education Spring” are continuing. This movement is spreading and I think last Spring's walkouts will spark more activity. As I write, teachers in yet another state, this one with a Democratic governor and a higher proportion of AFT and NEA members than in the “red states,” have a Facebook page and are formulating their statewide campaign for direct action. Activists throughout the country, meeting in the United Caucuses of Rank-and-File Educators (UCORE), under the umbrella of Labor Notes, are now in contact with activists in the “red state” walkout movement, and this connection is creating a network that has the potential to democratize both unions, creating conditions for coordinated direct action nationally. This new generation of activists is building a current in teacher unionism that never before existed. Unlike the members of teachers unions in the 1930s that were controlled by the Communist Party (CP), the majority of activists I’ve worked with understand, perhaps without articulating it as I do or agreeing with the history of the CP as I see it, that defense of teachers’ working conditions and economic needs must be fused with work on social justice and depends on principles of union democracy. Whether they succeed in this project depends on many factors outside our control. Democracy is at risk, our opponents are adroit and powerful, and we are in a race against time. But when what occurred inside the AFT convention is analyzed light of events outside the convention center, I think we are seeing a situation eerily like what existed when the Berlin Wall fell. We cannot know how or when one-party rule will implode, nor should we base our actions on that speculation, but it is apparent the AFT leadership is incapable of solving the union’s crisis and reform movements are rapidly gaining momentum. The AFT’s one party rule is likely doomed. The question is what will follow. The answer depends on how the reformers conduct themselves now so as to inform and support their leadership as they are elected to office – which is coming, rapidly, all over. There are several "ifs" here. If the movement stays committed to union democracy as its rudder and allows its sails to be powered by the winds of change coming from all over the nation, including the “red states,” with the yearning of so many teachers for dignity for their work, if the movement stays fast to its determination to fight for social justice and peace, for the alternative world we are told is impossible, then we can be very hopeful about the vigorous contestation by teachers and their unions of the project to destroy public education, organized labor, and democracy. You can follow me on Twitter or Facebook. I encourage replies to this blog on our interface. Let’s have the discussion here that didn’t occur at the convention!